Though I am getting started late, after much consideration, I have decided to jump in and do this “pagan blog project” thingy…not in any official sense but because hey why not..it would be a fun way to organize my thoughts to follow through in this pattern. So here we go. A is for alcohol…A for Apollon was my first instincual choice but I talk about him *constantly* so I decided that to make it a bit more work on my part I should go in another direction. So then A is for alcohol. I have spoken before of the symbolism of the wine when it comes to Dionysos…in fact I have spoken of it *at length* so I will just gloss over that part when I come to it. Needless to say though that alcohol in various forms has played a significant part in European and Mediterannean religions in general. While wine tends to have a history of superior sacredness is most of the ancient Mediterannean it doesn’t detract from the fact that spirituality through alcohol has also been anciently linked in other parts of Europe to mead brewed from fermented honey…a practice that has also been carried out in Hellas though not possessing the distinguished place that wine has…perhaps attributed to its dark bloodish hue as the “purple wine” which associates it with the highest of divinities. That said, I do think though that when we have the contest of Aristaios against Dionysos in regarding libations, we can see a history of mead being a pleasurable offering to the Olympians because how else is honey to be libated in its raw state. Raw honey is fairly thick and while tasty is not a very convenient substance of libation. I would suggest that considering that there is a mead that is common to Hellas it more likely that this offering of Aristaios, the son of Apollon, would have been the fermented form of honey…mead. This would place it in an even contest squaring off against the offerings of wine from Dionysos. This would also make sense agriculturally in which honey, as both a wild and domestic product, probably has a more ancient providence as an available resource than the cultivated vineyard. And both substances are viably connected with spirituality and the soul in both their fermented and raw forms. This then gives us the *golden* honey of the bees (golden being in itself a signifier of divinity for which it was not uncommon to gild with gold images of the gods) which is fermented into an equally golden..though sometimes reddish, elixir as mead, and the grape vine and cluster that produces the wine. There can have even be said to be some mild connection between them as Dionysos has been associated in icons as a kind of bee himself. But this makes a kind of sense too when we consider some mythic sources that have a daughter of Aristiaos, a girl named Melissa (the bee) as a nursemaid for Dionysos. In such a manner Dionysos was suckled on the substance of the bees as if he were an immature bee himself. For which we can also take another leap and say that the first alcohol substance that Dionysos drank from was the mead of Aristaios. The domestication of bees is the art directly attributed to Aristaios, the shepherd of the bees…specifically the bees of the Muses. He plays a role towards the bees like that which Apollon plays for the muses, he is essentially the ringleader. That he is called the shepherd Apollon we can infer that his providence as shepherd is related to the domain and function of Apollon. Essentially Apollon is the leader of the muses, the leader of the bees (for which it makes sense that his own oracle is also refered to as a bee) and Aristaios is the domesticator of these in relation to his father’s domain, in which he makes the gifts of the bees more accessible to human kind by the art of horticulture. If the bees are related to muses, and the arts of the muses specifically, we can the bees as more specifically the children of the titanide Mnemosyne. By which the practice of the thyiade nymphs from whom bee divination was said to have been is specifically tapping into the well of Menmosyne…the memory (arguably nonlinear) of the world. As such it can be said that mead is a fermintation that is directly associated with the divine essence earth. That the gods, while delighting in both, found the wine of Dionysos more pleasing seems to be a matter of very slight division when we compare the two substances. After all both are alcoholic substances which, to remind you from my previous posts, serve to elevate through a sense of euphoria in simulation of the blessedness of divine existance and allows a kind of temporary connection with the gods in moderation. So we must then divide among the few differences. Source: Wine and mead have to very different sources. Mead is by and large an animal byproduct because it comes from honey. Though this originates in nectar gathered from flowers, much of it also comes from the internal processing of this nectar by the bees to make it into a food source for their hives. It therefore requires an “animal” intermediary between the raw substance and the honey which can be fermented. Of course there ways to make artificial honey from boiling flowers with sugar but when compared to honey it is quite inferior in color and flavor….and I don’t really think it can truly be called honey in any case. Some might say though that this extra processing can be what makes mead a more valuable substance. Wine on the other hand is a vineyard plant, and the fermintation comes directly from the grapes. It cannot be comparable with beer, which is grown from grains, because this is a substance which comes directly from the fruit of the plant and part of a painstaking cycle in which flowers need to be fertilized (the marriage of essences) in order for the blossom to bear the necessary fruits. This process can of course be considered very reflective of the initiations preserved in pompeii in which the initiate is addressed as a kind of bride. The fruit, the summation of the flower’s being, can only be accomplishd via the marriage of essences, just as life takes a husband and wife to propigate a new life…however we cannot consider the fruit a new distinct life from the flower which makes it symbolism all the more poignant. It is a rebirth of the self. Therefore wine itself is the transformation (via fermentation) of this higher self. The wine itself then has an arguably great symbolic presence when it is offered, as it may be more aligned with the offering of one’s soul and being. Honey (and mead) has a very mellow and beautiful golden color which seems to connect by that virtue to some identity of the divine. As such it can be representative of the divine world in general. This possibly explains why honey is such a popular offering to chthonic deities, nymphs etc. Wine is red/purplish in hue (taking the white wines etc out of consideration for a moment) and in its character represents blood, but also can represent royalty as this reddish-purple hue was a popular fabric die for those of royal lineage. Therefore we can say that wine is “royal blood”. It is the highest essence of the greatest gods (Zeus specifically via Dionysos). As such its color can also be representative of the essence of life (in all its various forms) in general. In the end the symbolic merit of the wine prooves superior to that of the honey/mead, and Dionysos wins over Aristaios. But in response Aristaios became the first to mix the two substances. This can take the form of honeyed-wine (in which honey is mixed with wine) or honey wine (in which, from my understanding, honey is part of the fermentation process). It is for this reason that I prefer to give honeyed wine as an offering to Apollon on his most sacred of days, particularly the mulled wine (which is made with honey and various spices) for Apollon Noumenios and the household gods on the Noumenia. However, regardless of what offering is given, it is clear that alcohol plays a significant role, but this doesn’t excuse excessiveness either. By knowing that alcohol is in part a holy susbtance it charges us to use it responsibily too and place it back in the realm of the sacred. The gods loved symposiums, and so I don’t look down at sharing a social drink with friends at a gathering or anything of the kind, but I do feel that this is different than the casual drinking just for the sake of drinking, and doing this excessively, and calling that spirituality. I have just realized that the only thing I seem to have posted about Apollon’s return is dated 2010, and so much has changed since then. Most of which I had revised in the course of writing my book on the worship of Apollon. It is funny how book writing gets you so much deeper into research than otherwise…that and I had a lot more time on my hands since I was unemployed at the time. As it is, I have been so busy with other things that I never even mentioned the festival Polytheus this year, I did observe it in a more simple manner than usual since I have been packing and preparing to move…but celebrate it I did. For those who are not aware, Polytheus is the festival during the month Anthesterion (usually in the first part of February but was this year at the tale end of January) which is, by the Boeotian calendar, the birth of Apollon… a period recognized at Delphi during their month Bysios and in consequently also in the Peloponnese from what I can tell, rather than the Ionian Thargelion. Thus Apollon was believed to have be born in this earlier date on the mainland and traveled to Delphi, which leads me to believe that Polytheus (the many oracles) has nothing to do with the return of Apollon from Hyperborea…but more to do with the arrival of Apollon at Delphi and for which the day was held sacred. Therefore the Polytheus I celebrate with clamorous celebration much in the character of how I celebrate the Thargelia. thus we may have a birth and “arrival” of Apollon in a sense but he is not yet *here*. I would suggest it can be as an ancitipation of the return of the god as the oracle waters flow as spring is returning. It seems like an appropriate time to gather small flowers that bloom in the early part of spring and set them on his altar. The crocus flower (the flower from the saffron), according to one source, was a favored flower for the altar of Apollon in the winter…one that could have been potentially blooming at this point of time. However, since most of us don’t have access to crocus flowers, it is appropriate, I think to substitute them with purple-colored flowers in general. This followed through by the celebration of the Stepteria which follows shortly afterwards in which the death of Python is celebrated (recall that Apollon was only a few days old in the myth). This festival is named after the crowning of the laurel…which really is the finale of the ritual. The Stepteria is about the slaying of the Python, the exile of the god, his supplication (which includes the city from which the myth of Admetus comes that draws an interesting parallel between the exile of the god for the death of the Python and the slavery of the god for slaying the Cyclopes) to towns on his way to the sacred laurel tree in the Tempe Valley. This trip would have taken a number of days with all the stops that were made. Having arrived boughs were cut for crowns and boughs gathered to bring back to Delphi. All of this done by a boy who represented Apollon, though he is believed to have been accompanied by an entourage of followers. The actually slaying of the serpent was carried out in one of two ways..both attested to (so it is possible that both may have been done). One was a combat between the boy and another man with swords (I will refer you now to the designation of Apollon as the god of the golden sword), the other man representing Python who is defeated. The other was that a snake was set in a tent (for lack of a better word) and set on fire. Whereas for a ritual involving many people I can see a drawn out dramatic swords fight, the chances of anyone burning a snake alive are slim….which makes effigies of a serpent much more likely for destruction. Having crowned himself with laurel, representing the purification of the god, the boy makes his way back, stopping again at all these cities rendering the blessings of the god to those who gave him hospitality. After these many days the boy arrives amid a fanfaire of singing and celebration honoring his return in the festival Herois. I believe that his festival may have occurred within the following month Theoxenia and was the pre- festival for the Theoxenia festival. It is difficult to celebrate the Herois sufficiently without the mystic journey of the boy actually happening, but the character of the ritual seems to be very much like the Theban Daphnephoria so it is possible to celebrate the essential elements of the Daphnephoria to keep with the spirit of what is happening and that is the procession of the god amid laurels…the Daphnephoria also includes a rather cool “scepter” which has two balls (a larger on at the top to represent the sun from which smaller balls (the stars) hang, and half way down a smaller ball representing the moon, which is entwined with laurel and white flowers at the top, purple flowers at the middle, and the bottom in a sheith of crocus-colored material. This, or a simple libation can be offered to Apollon a few days before the Theoxenia and then celebrate the Theoxenia (the seventh of Elaphebolion which is coming up at the end of this month) with all props and honors. The Theoxenia marking the festivity of the gods who have gathered to Apollon’s banquet…with special significance given to Dionysos (as would merit a festival in which Apollon and Dionysos are exchanging power not unlike references to the autumn festival would have us believe). Coincidentally this would also coincide with the return of Apollon to Delos. In the cult of Apollon on Delos there is was a long standing tradition that the oracle was active from spring equinox to autumn equinox at Delos, and then for the other part of the year at Lycia. This is on thebasis of the myth which differs from the Delphic myth in which Leto, with her infants went to Lycia and there they remained until the Old Man of Lycia (so honored by the Delian Maidens) returned Apollon to Delos. This same Old Man according to myth accompanied Apollon eventually to Delphi. So therefore I add a component of honor to the Old Man of Lycia and also engage in singing and stamping the earth with my feet in honor of Apollon’s springtime return in the manner which is described of the Delian Maidens. I am, of course, truly looking forward to carrying out this celebration in Florida where I hope to be able to stand on the beach and see the reflection of the sun upon it as I stamp my feet for the glory of the returning god Apollon. With Anthesteria amd the celebration of the returning spring as flowers bloom and kid goats are born, there is a general awe towards Dionysos who, as he ever returns from the underworld, represents a spirit of resurrection and the immortality of the soul. He is the slain bull who goes as a seed into the earth to travel the next world and be reborn. He doesn’t die for our sins, and yet his myth is a mystic program for the soul. And it all begins with Semele and Persephone. We know that the first Dionysos, Zagreus, was born of Persephone and Zeus who came to her in his chthonic form of a serpent and impregnated the goddess without her mother’s knowledge. The serpent form of Zeus is one that is very particular, especially within domestic worship since we call the god who protects the stores of grain and other foods by the name Zeus Ktesios and place an emblem in representation of him in the form of a serpent in on his jar. Therefore we see a form of Zeus which regulates production, which preserves the grains and fruits of the earth, and is associated with the idea of harvest in general which stocks the warehouses. Thus Zeus Ktesios is honored in the household as a god who preserves the bounty of the harvest for the future. The agathos daimon (also depicted as a serpent) has often been connected with Zeus imagery for similar reasons as a god who is bring goodness to the family. So you have a serpetine Zeus, associated with abundance, who fertilized the Kore. She is associated with the flowers of the growing season, but flowers that must be fertilized and drop their lovely petals in order to bear fruits. It is for the purpose of production that we see this allegory as we honor her with spring flowers but also when grains to ripen. Therefore we can see Zagreus as a manifestation of the divine fruit born of the earth…a fruit which is cut up and consumed and then dispersed by ash as the Titans who murdered and ate Zagreus were reduced to ash themselves with the thunderbolt of Zeus. Clement of Alexandria, in his anti-hellenismos rhetoric such as it is, speaks briefly of the mystic symbolism of those items which the titans used to lure Zagreus to his death. Items which are important (though he mocked them) for a very specific reason. Consider that humanity arose from the mud mixed with those ashes of the titans, and therefore from those ashes the divine spark was given to humanity, would you not rever the item which caused the harvest? It is only be the harvest, the sacrifice of Zagreus, that we attribute the divine spark within humanity, the immortality of the human soul. Therefore these symbols could aptly be a way to rever the divine within us from Zagreus, but also be a symbol to the way to progress foreward…as all these seperate symbols combined together could equate to the divine state. Clement of Alexandria speaks of the looking glass for instance…wouldn’t the looking glass be representative of reflection? I recently did a drawing of Mnemosyne and in constructing it I came up with the idea to use a mirror…because memory is part of the art of reflection. Pythagoras too recommended for his students to reflect every night before bed so as to encourage the memory of the soul. Even Aphrodite, the mother of harmony who obsolves conflict, is pictured with a looking glass. Certainly not from any case of vanity but a greater meaning that can be associated with the mirror of Zagreus….”I see myself as I am, I see all that I am and all the spiritual beauty I possess, I see all that I have been in the past and will be in the future, I see myself and know I am divine.” All of these peices make a whole even as Zagreus was divided into many. Therefore the mystery of Zagreus is the one which is the birth and transformation of the soul. But this cannot be completed with Zagreus alone, Zagreus is divided, but we need the unification of the parts. So born was Dionysos to Semele, born of a mortal mother, the princess of Thebes, daughter of the hero Cadmus and Aphrodite’s daughter Harmonia/Harmony. 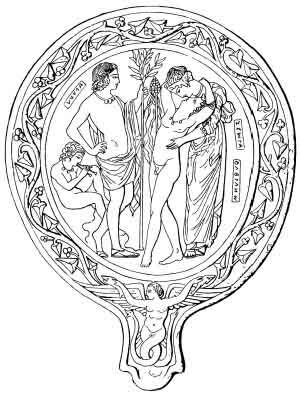 Semele, in her love affair with Zeus, was given the heart of Dionysos, the one part of Zagreus was kept by the gods. And so the princess took Dionysos into herself. This seems to me to have some meaning in light of the practice in Athens for the Anthesteria in which the queen was wedded to Dionysos, and so is joining with the god and taking him into her, perhaps to symbolically by fertilized by the spirit of the god and birth bounty and the divine blessings of the god for the city-state I could guess. In this fashion she would be aligning herself with Semele. I know this sounds a bit strange, and even stranger in some of the mystic mirrors of the Etruscans in which Dionysos (Fulfuns) appears to be embracing his mother intimately with Apollon (Apulu) looking on with a flute player…possibly representative of Pan…just behind him. Of course the story follows that Hera tricked Semele into asking Zeus for a boon, and so that when he agreed to give her anything that she desired, her wish to see Zeus in his true form caused her to combust leaving behind the premature Dionysos which Hermes rescued from the ashes of his mother and brought to Zeus so that Zeus could sew the infant into his thigh (a very strong procreative symbolism there associating Dionysos with the sexual center of Zeus!). Dionysos was thus born a third time, directly from Zeus this time and set about his youth and adventures being raised in the mortal world and his desire to join the gods (via the instruction of Apollon who was, with his company of Muses, the first to recognize the god. Eventually Dionysos departs to the next world to gather his mother that she may be among the company of the gods. This departure is represented by the tearing apart of the bull and the ivy by the Thyiades who consume it. Essentially Dionysos is sacrificed by the women of his retinue and becomes a part of them, from their consumption of him. In such way he is coming into contact symbolically again with the substance within humanity even as he moves to the next world. Aristophanes’ in his play Frogs puts an amusing spin on the whole adventure which leaves out the death of the god and engages in amusing conversations with the souls of the deceased that commulate in a test of knowledge between those much lauded in the next world…giving a nodd to the idea that the knowledge of the soul that it has accumulated places it in a higher level in the next world. This makes Frogs an entertaining and also relevant comedy for this season, a seaon which is celebrated coincidentally with comedies….as comedies address a different venue of the mortal existance than the tradgedies do as the former are arranged in a celebration of life. In any case Dionysos and Semele do not emerge together. No something else happens. First Dionysos returns, he is the infant in the Liknen basket who is born in a cave on Parnassus. Paranassus is quite a fascinating place. It is not only the mountain which overhangs Delphi, the navel of the world, but it is also the place where the remains of Zagreus were buried by Apollon. And it is from this mountain in which the bones of the earth (the stones…perhaps also symbolically merging with the bones of Zagreus who is buried there) were thrown to create new people after the Flood. Therefore Parnassus has a strong association with death and resurrection just by these means. It is no wonder then that in the cave of Pan, high in the mountains, that the Thyiades, in midwinter, would greet the return of the infant Dionysos. Semele, alternatively, comes with the spring. In such respect she is aligned directly with the Kore. There is an image of the return of Semele which is quite profound. A vase painting which showns a mound. To one side is Apollon (with Pan beside him), and to the other side of the mound is Dionysos. All three gods are gazing down into the ground. There Semele is rising with flowers and all the emblems of spring with her. She is likened to the Kore who is ascending to the divine company. And thus Semele is the as a goddess of spring flowers herself. I had seen, yesterday, a lovely statue of Dionysos with a small figure of a woman that I had assumed was Semele as it appeared she has a small fire in her hand, but later found out has been called by academics Spes (the representation of Hope) carrying a lily. I am not entirely sure what they base the labeling of the figure as Spes off of, but the lily does not distract me from an identification with Semele as a goddess who returns in the spring. And her return is characterized by her divine name Thyone who is described as the fiery mother of Dionysos and is recognized as representative of the unification between Dionysos and the celebrant in which they partake frenzy as they are filled with the divine essence of the god. Which again connects back to the spirit of Anthesteria as we see Dionysos joining with the queen during this ritual, the very act of which is governed by Thyone. I would hazzard to suggest that it is in this fashion, this interaction of Dionysos, the thrice born god that helps the human soul slowly gather up the peices, the symbols of Zagreus by which the god was distracted by the titans, and bring them unity. Dionysos in this fashion is the liberator of men because he rejoins men to the gods, that which is represented by the communion with his wine. So hail Dionysos on this Anthesteria! This is a post I have been meaning to write for the last few days, but I have been thinking of just how I wanted to present it. It is certainly no secret that in Hellenismos there are a prominence of horned animals sacred to gods. There are the oxes of Hera, the bulls associated with Zeus, Poseidon and Dionysos, the goats of Pan, Zeus, Dionysos, and Apollon, the deer likewise associated with Dionysos, Apollon and Artemis. And naturally many other gods that I just can’t think of at the moment. Clearly there is some powerful symbolism at work that animals who have some form of bony substance protruding upward from their foreheads have some special relevance in our worship. The idea even carries forward into the medieval period with the sacred symbolism of the divine via the unicorn imagery which any person half way familiar with the unicorn tapestries would have some vague knowledge about. We should perhaps then infer that the upward horn represents itself a state of divinity, from which we can also construe significance in the horn of plenty with which we are familiar with. In Roman art we see Fortuna (Fortune) and Ceres carrying the cornucopia brimming over with the wealth of the world that the gods have given to us. In Hellenismos we are familiar too with a myth of Zeus in which the goat Amalthaea who nursed him was sacrificed by him and it is her horn from which the horn of plenty comes, she who sustained the king of heavens. This of course lends a very particular symbolism associated with goats….the male goat representing masculine fertility (for Zeus is very fertile in his nature, as is Dionysos who was carried near this fertile zone of the god for his final period of gestation), and the female goat representing the divine nurse. Therefore it is not surprising to me at all when I see a goat image in Thracian rhytons (drinking horns) because this divine fertilization I connection closely to the very essence of the wine which Dionysos so liberally distributes. Likewise a female goat portrayed in proximity to a goddess indicates a function of the goddess as a Kourotrophos deity. 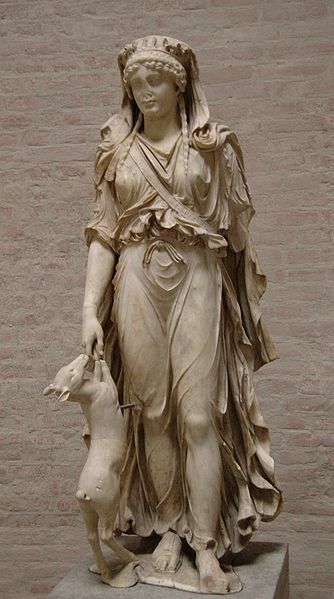 There is for instance one statue of Artemis with a young animal which some say is a faun but also looks to me, because of its size and general shape, to perhaps be a goat instead with the small budded horns on its head and curled tail. But I guess we will each have to decide for ourselves what we think it is. In symbolism stags have a great deal in common with goats if you get right down to it…differing mostly that deer are typically not associated with the nurse aspect, but are instead as fauns are often pictured as nursing from the Maenads (probably referring to the first Maenads that are nymphs and not literal historical followers of Dionysos). In such respect they are recepiants of “divine” nourishment (via the possession of Dionysos within the nymphs) which seems to link them to a greater specific connection between the divine and the mortal…as a bridge between the two at a greater symbolic level. Perhaps rather the mortal desire to draw closer to the gods, and pursued by Artemis when they are mature (whereas the young faun is represented peacefully at her side. Apollon, alternatively, has been represented in Hellenic and Etruscan images as holding a stag within his hand. He is seldom pictured with a faun…usually only in cases where he is in the company of his twin, but is always associated with the adult male deer, and to a degree the hind of Artemis…a sacred golden horned female deer. Such imagery with this deer are generally very specific though to the myth of the labors of Herakles. (Natural History, Book 8, 41): A stag, when wounded by an arrow, can eject the arrow from the wound by grazing on the herb dittany. If bitten by a poisonous spider, the sta…g will eat crabs to cure itself. (Book 8, 50): The stag is a gentle animal. Stags are very lustful; the mating season begins after the rising of the star Arcturus. When deer hear hounds, they run down wind to avoid giving themselves away with their scent. Deer are simple animals, surprised at everything; they can be charmed by song and by a shepherd’s pipe. To cross seas they swim in a line with each deer’s head on the back of the one in front of it, and they take turns moving to the back of the line. A stag’s age can be told by its horns or its teeth. Stags lose their horns every year, and retire to secret places to do so; their right horn, which is never found, is said to contain a healing drug. The smell of stag horns burning stops an attack of epilepsy and drives away snakes. Stags are at war with snakes, drawing them out of their holes with the breath of their nostrils. Stags live a long time; the ones that Alexander the Great had put gold necklaces on were caught a hundred years later, and the necklaces were found to be covered with folds of fat. Stags are not subject to feverish diseases, and eating venison is said to prevent fevers in people. (Book 10, 5): Stags fight with eagles: the eagles cover themselves with dust, perch on the stag’s horns to shake the dust in its eyes, and beat the stag’s head with their wings until it falls. (Book 11, 115): The breath of stags scorches snakes. We can therefore infer that the stag represents a sense of community support via their cooperation in navigating streams (ei currents of life as I can see it representing), with swift movement (which can infer swiftness physically but also mentally and on higher levels), that they are long-lived and so like any long-lived animal are probably associated with a concept of immortality or the divine state, this also seems to be addressed by so called curative and protective properties within the flesh and horn of the stag, as well as the fertility symbolism that we find in goats too. But what particularly interests me is the symbolism with the mind. More so than most other horned animals, it seems that proportionately to its skull the antlers of a stag have a more pronounced upward extension as it ages…the older it gets, the more impressive its rack gets which is quite curious considering that deer tend to drop their antlers. But there is just something entirely awe-inspiring of seeing a five-point (or more) buck. In such respect it seems likely that the symbolism of deer is connected to achieving a state of consciousness close to the divine level which is accomplished through rebirth (and therefore associated too with Dionysos who, like is maenads, is also represented wearing the spotted faun’s skin). This doesn’t seem to far-fetched of an idea if we consider a different culture for a minute, and think of the hindu religion. I had recently read that when the stag is represented with Shiva it is because the stag is associated with the mind, and Shiva is able to control the swift moving mind and bring it into stillness. Though this is a different symbolism, a kind of divine state of mind does seem to be represented. Dionysos himself, and his followers, appear by necessity to be direct connected to deer in its faun state, as we also find the greatest number of associations of the deer with Artemis. I think that this is particularly telling. In one hand we have the flayed faun…the young immature..hornless…deer who is slain which I think speaks to me of mortal rebirth. And this is the faun that is suckled by Maenads and is tended kindly by Artemis. Thus the fawn represents mortal life that enters exits and enters into life through numerous incarnations, that is fostered and cared for by the Kourotrophos, that is suckled by nymphs, that is held by Dionysos until the stag comes finally to Apollon who represents the divine boundary…Apollon of the Boundaries, the end of his sacred road. He who receives Dionysos. He who receives that which is slain by his twin….whether that be her stags or her goats (the latter of which he used in myth to build their horn altar at Delphi). This post is inspired from a conversation from an interfaith community regarding a question about drunkeness on Olympos. Though my opinion wasn’t very popular among the general pagan community as far as I could see, I do think it was relevant when taken from the perspective of ancient Hellenic practices and myth. My point is a rather simple one…there is no drunken debauchery-frat party thing that can be or should be associated with the Olympians….because the Olympians don’t need wine. There are few instances where you see Olympians imbibing in wine in myth. One is when Hephaistos fell from Olympos, Dionysos guided him back (presumably wine was involved), and the most tell one in which wine was banned from Olympos because Dionysos made Aphrodite drunk on it and their union produced Priapus. Of course there is nothing wrong with Priapus in general, despite being rather a bit of a trouble maker in myths when it comes to spouses…and he was linked both to the worship of Dionysos and that of Apollon as in some regions Apollon held the epithet Priapos. Rather this speaks from a mythical setting, that wine itself is not part of Olympos…and this may have something to do with the nature of wine itself. In an earlier post about Dionysos I spoke of how wine is a symbol of the divine essence, and that upon consuming wine a person temporarily was possessed with this essence (for lack of better words) which brought about a mind-altering experience that simulated a closeness to the divine state. That said, lesser gods and divine beings could reasonably enjoy it too in order to feel a temporary elevation to a higher state themselves (Olympus being the highest state which is probably why it is represented as a mountain…it is the summit of being for our world). Plato in his Phaedrus, when he is talking about the companies of the gods he illustrates that there are different levels of height to which different beings can achieve, and that certain beings can only go to so high, but only the chariot of the Olympians can travel all the way to Olympos. Similarly no one can go to Olympos without being brought there by the gods. I recall as a child watching an animated retelling of the story of Bellephron, and how shocked I had been when he decided to take it upon himself to travel, via Pegasus, to Olympos since he was irritated that for all his heroism that the gods had not invited him there. Pegasus represents the possibility of travel to Olympos, though Bellephron did not make it. But Pegasus belongs to the gods, not to mankind, and therefore afterward only journeyed as the gods directed. So in my long about manner this saying that there is a great distinction of the different heights…and the heighest of heights…Olympos. Therefore it is reasonable that wine, the substance of Dionysos..the hier of Zeus, would be enjoyed by non-Olympians (thus enjoyed by satyrs, and even the Erinyes were made drunk by Apollon in order to ease their furious intent and induce peaceful slumber), and especially enjoyed among mortals. However, this altering substance is not necessary for Olympos. The Olympians infact are described as drinking ambrosia. So whereas wine represented the divine essence symbolically, the ambrosia is divine. When reading the homeric hymn to Apollon we read how instead of suckling from his mother that he was fed Ambrosia…by Themis I believe….and straight away leapt from his infant wrappings and golden chords that bound them. Even in the Iliad we can see ambrosia among the gods being treated similar to the wine among mortals, that it was shared among each other when gathered together, as when injured, Zeus gave Ares ambrosia to drink after his wounds were healed and Ares refrained anymore from the battle. That said the gods prefer wine as their offering from mortals typically, though this doesn’t seem to the case with most goddesses whereas wine as not offered or entered the ritual. The exception may be Aphrodite, who may also be alluded to by the myth of Dionysos getting her drunk on wine. There was also the ritual of Thesmophoria in which women gathered in secret together, with casks of wine (which Aristophanes refers to in his play Thesmophoriazuseia). But for the most part these are rare exceptions. Of course this also echoes a practice of women often not being permitted to drink wine. I am guessing this has something to do with the receptivity of women. Recall reader that in another post I said that women are more easily engaged in entering a love relationship with the gods. Similarily the first followers of Dionysos were women, and his maenads nearly terrifying with their possession of divine madness. Men were supsicious and slower to embrace the god, which we see from Euripedes’ Bacchanalia, but once engaged they too enjoyed it passionately. Even so, the ancient Hellenes cut the wine with water, because raw wine was considered too dangerous as we can see from the myth of the introduction of the grapevine by Dionysos. But that the Olympians in general (perhaps the male half in any case) show a preference for wine among all other offerngs we can infer from the myth of the contest of Dionysos and Aristaios. Each made their offerings to the Olympians. Aristaios offered honey (also a symbol of immortality) from his bees, and Dionysos offered wine. The gods found the offering of Dionysos to be superior, but thereafter Aristaios was the first who took to combining the two substances together. However, that the Olympians prefered the wine, doesn’t not necessarily mean that they are drinking it. The wine is offered into the fire…the essence..the vapors that rise…this is what the Olympian gods enjoy from our offerings. The smoke. Therefore they are only receiving a portion, perhaps the better portion, of the wine. When I pour wine as a libation into my oil warmer, it is like a delightful perfume wafting up. But this does not mean that the gods are up on Olympos getting drunk and partying. They exist in a state of bliss and happiness which wine can only echo imperfectly. They may enjoy the offering of the substance, but it doesn’t impact the state that they enjoy. However, this does not mean that they are existing in a constant state of soberiety either. They are in a bliss that doesn’t need alcohol, because they are in the heighest state. Description of the court at Olympos though are hardly boring displays, but filled with music, dance and joy as we can infer from the Homeric Hymn to Apollon. In the end we are unable to understand the perfect happiness of the state of the gods, but for a moment we can feel a little closer with a drop of wine. Despite the fact that I dont count Dionysos as one of the 12 Olympians, each of which has a cosmic and wordly application under whom all others fall into line, I wanted to take a minute today, inpsired by a recent online conversation ongoing in a community, to speak of Dionysos because inspite of this I didn’t want anyone to go away with the impression that Dionysos isn’t held to great importance. That said I think his importance is relative to worshipers more on a personal level because I think he, in a sense, embodies the personal interaction between the gods (particularly Zeus) and the mortal race. If Apollon loves humanity and according to myth persuaded his father via song from starting over gain with the human race, and if Hermes is the helper of man, then we can understand the strong association in this brotherhood in including Dionysos who is the god the closest and most intimate to us, all in equal measure without discrimination…a freer, a lover, a leader of revelry and bringer of joy and peace. He represents the divine bestowing of the most gracious gifts of the gods. It is no wonder he is honored in Aristophanes’ Peace play in celebration of..well..peace 🙂 He is also representative of the state of divine possession, of madness, as he was struck with madness by Hera and so too his maenads display madness in their possessions. It is this same madness which is associated with the wine, divine substance personified, which we take into ourselves in his honor. That liquid force, the inseminiation of divine vitality (quite appropriate for a god enclosed in Zeus’s thigh, so near the point of reproduction to also be associated with a divine masculine reproductive principle which is further carried out also via the phallic image of the thyrsos. Dionysos is the fertile and inseminating god, making of course Pan one is his perfect companions who likewise carries this association. But he acts on a different level than Pan, who is largely concerned with reproductivity and influences, like Apollon, generation (as Apollon made the flocks and herds of Admetus numerous, dropping twins each, therefore being more specific to individual cases than the general fertility of flocks regulated by Pan and, to a degree, Hermes). Dionysos, on the other hand, does seem to be especially connected to any of this, but rather associated with fullness, ripeness and more fruiting associations. Therefore in my mind this seems to be more in line with the ideas of ecstasy, being full via spiritual union and love for the gods, and the immortal nature of the soul, as argued by Socrates in Plato’s Phaedo, and as associated with agricultural ties, which drinks, becomes enlightened and aware, is filled with bliss, happiness and goodness. Something especially considered of great power, as a poet of some fame, I forget his name specifically, but I believe it was Alcaeus (I quoted this poem in my book I think) who calls for wine as a friend to old age. And why not? When a lifetime has passed, and one becomes weary, the warmth and cheer of wine in the winter, as in the winter of one’s life, is uplifting. Dionysos represents this influx of divine grace toward the immortal soul as far as I believe it to be, this different brand of insemination and fertility. I may be very slow at building his shrine, and took quite some time to select the perfect statue of him for my home, but I don’t see him as a god that really needs a temple or shrine of any kind to pay direct worship at. Instead Dionysos is celebrated with every act of joy, and every act of communion with the gods, with every act of kindness and expression of humanity towards others, and certainly with laughter and revelry! Next time you are laughing among comrads sharing drinks and food together know that you are honoring Dionysos. The next time you get on the floor and play with your children rough and tumble, with them squeeling in delight, you are honoring Dionysos. And when you dance, pray, or sing in heartfelt wonder to the gods, remember that Dionysos is also so honored. He is honored in the goodness that is cultivated within and that we share. The fermentation of our life experiences which we can hope in the end will become, like the juice of the ripened grape, a great elixir. So I may not have much of an official place to honor Dionysos, and I may not consider him among the Olympians, but I love him all the same. Hail Dionysos!